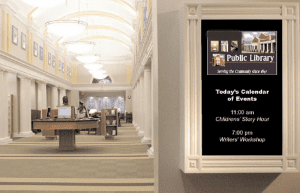 Delivering timely information via digital signage is critical across all public and government sectors. Highly visible, clear messages on public digital signage screens are the most effective means of communicating with a target audience, and at Signbox Microsystems, we offer digital signage solutions that instantly deliver real-time information, when and where it’s required. Delivering timely information is critical across all public and government sectors. Government agencies are charged with keeping the public safe, so getting important information to public occupants of government buildings must be done at a moment’s notice. In the corporate sector, as well as disseminating information, we can also capture and report data through interactive software add-on modules. In addition to being a fast and effective means of communicating, our digital solutions for the public and government sectors are also more cost-effective than printing and distributing paper-based information, which is frequently out-of-date by the time it gets back from the printers! An entire digital signage screen network can be managed from a single server PC, so hardware costs are also kept to a minimum. For more information about our digital signage solutions for the public and government sectors, please contact us today at Signbox Microsystems.